One decade ago, Ithaa at Conrad Maldives Rangali Island was spectacularly ‘sunk’ five metres into the waters of the Indian ocean and ever since it’s been the mecca for lovers of food, culture and architecture the world over. Sitting like a pearl beneath the waves (Ithaa translates as ‘pearl’ in the Maldivian language of Dhivehi) the curved acrylic walls which give 180-degree panoramic views set the trend for unique dining. It became the world’s first aquarium-style undersea restaurant – indulging diners with stunning views of the surrounding lagoon, reefs and tropical fish. Consistently recognised as the most beautiful restaurant in the world, Ithaa is fast becoming a 21st Century travel icon, so it is no surprise that as one of the world’s most expensive and exclusive places to eat, there is no better place to showcase the finest wines. To coincide with the date the restaurant first opened its doors – April 15 – Ithaa will host a Château Margaux sommelier dinner*. The unrivalled wine estate of Château Margaux dates back to the 17th Century and is renowned for its grapes as its prices. A bottle of 1787 Chateau Margaux was sold for $225,000 making it one of the world’s most expensive wines. This is the first time Château Margaux have been invited to host at Conrad Maldives. Kamal Malik, head sommelier says: “Ithaa sets the trend for dining in the Maldives, being the first to understand and truly demonstrate that a remote location needn’t prohibit fine dining and good wines. It’s the obligatory choice for the gourmet traveller and has the most passionate, extensive and exclusive wine programme with more than 1,400+ labels and up to 20,000 bottles on the island. The Château Margaux sommelier dinner will add something extra special.” Past wine-pairing dinners have included Château Latour, hosted by Frederic Engerer, a Pol Roger Sir Winston Churchill Verticals dinner and a never-to-be-forgotten Louis Roederer Cristal Verticals event which marked Ithaa’s 5th anniversary, and most recently a Dom Pérignon verticals dinner hosted to mark the 10th year sinking of Ithaa in November 2014. 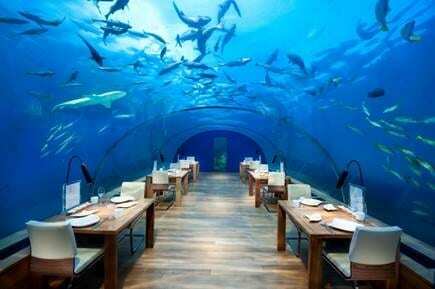 Meanwhile, inspirational fine dining is at the heart of the Conrad Maldives experience. Ithaa diners are offered ‘contemporary Maldivian cuisine’, taking local spices, seasonings and traditional cooking methods, but adding a western twist to create an innovative style of cooking that has not diminished in the past years. Envisioned by Mr. Ahmed Saleem of Crown Company PVT, owning company of Conrad Maldives Rangali Island, Mr.Saleem was inspired whilst travelling in Bali in 2001 and five years later Ithaa was brought to life by Mike Murphyof M J Murphy Limited in New Zealand who specialises in aquarium technology and at a cost of US $5 million, Ithaa took 85 tonnes of sand ballast (in sandbags) in order to be sunken onto the ocean bed. It wasn’t long before it became a cultural phenomenon and world-leader in beauty and cuisine that continues to intrigue and impress to this day. Nightly rates at Conrad Maldives Rangali Island start from US$1,240 (approx. £735), based on two sharing a Beach Villa on a Room Only basis. Rates are subject to change. Prevailing taxes and service charge apply. www.conradhotels.com/maldives. British Airways (ba.com) flies direct from London Gatwick to Malé.